9 pm — RSV is negative and really she is improving a TON, but wanted to be sure since she had some new signs today. We stopped bactrim and started omnicef and tobi nebs instead. CLICK on album cover to see ALL the pics.. Happy Birthday to Ms. Janet!!!!! She is Ally’s EXTRAORDINARY one-on-one aide at school. 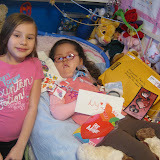 2-14-12 1:30 am — Ally’s Monday Update // Happy Valentine’s Day! Well, Monday was a little rougher for Ally than I expected. She made sooo many strides on Sunday towards better health, that I was hopeful we could maybe keep our orthotics appointment to get new therapy shoes and maybe go to Shriners. I figured I’d let Ally lead the way if we were going or not, and she made it CLEAR we were staying HOME. Unfortunately Ally threw up 3 times on Monday and her low grade fever stayed constant most of the day. She enjoyed watching her cartoons, but was very flush and working harder, so we took it easy and our new nurse helped do some extra breathing treatments. I also simplified her food mixture and slowed down her feeds some more. By the evening, Ally began to turn the corner again, for the better. Megan, our 1x a week overnight nurse, came in and Ally has done very well for her. I’m sure a lot of it is the hard work and prayers paying off. Ally was able to tolerate doing 2 full breathing treatments, including her shaky vest without throwing up and her heart rate stayed down. She even painted a little with Megan and then fell asleep. It’s 1 am and she is sleeping peacefully. Her heart rate is not back to its complete norm, but fevers are gone (knock on wood). Oxygen sats are also staying good without using any. So for Tuesday, Valentines Day — We will be overall keeping it low key. We may pop by school to deliver Valentines to the kindergarten and a birthday gift for Ally’s AMAZING 1-on-1 classroom aide, Ms. Janet. Ally will lead us in making that decision though. Billy already had the girls and my Valentines delivered. Yummy – chocolate covered strawberries!!! I’m trying not to be upset about how much they cost and focus on how thoughtful he was (LOL). Maybe I will make a special dinner for us?! 5 am update — Miss Ally woke me up at 3 am making some noises for me to suction her and bright eyes for me to turn on the TV! She went 7 hours between breathing treatments and did well with it. While her nebulizer/IPV was going, I was able to organize her dresses and actually have an ENTIRE box of gorgeous dresses to pass along to a friend. She is overall doing soooooo well and I think we will even go to her appointment for AFOs and stander. 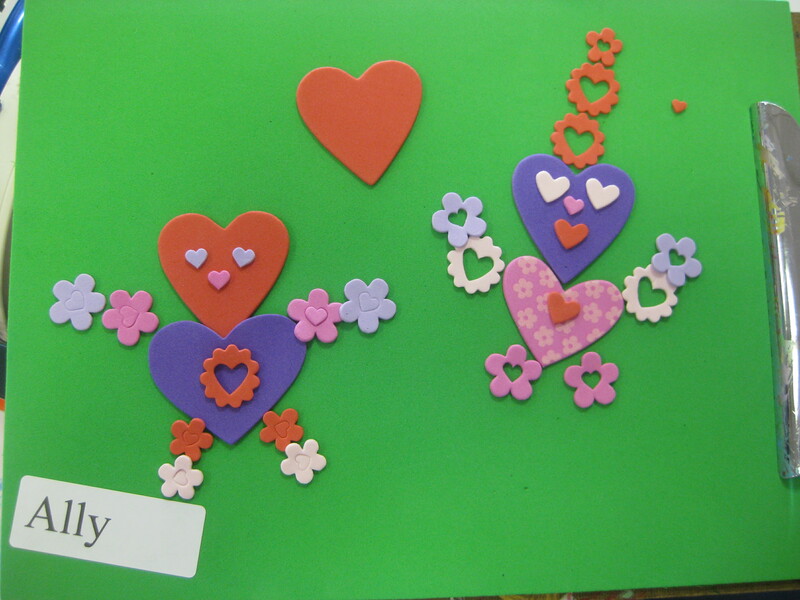 Might even be able to do Valentines at school with her kindergarten friends on Tuesday. YES, I might sound crazy, but these illnesses remind me that she/we need to live life to its fullest!!! 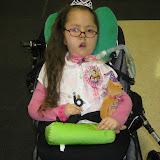 Sooooo grateful to God, prayers from friends and family, and her trach! My daughter is my HERO!!! Also soooooo proud of my oldest girls, Kristyn and Melissa. Kristyn’s cheerleading team competed at State on Saturday and did not place, but did well. Melissa has been doing well playing with our neighbor and behaving the last few days during the scary illness part. I LOVE my hubby dearly who has helped me GREATLY this whole past weekend too. Well (With MY appropriate vent setting changes) Ally slept from about midnight till 5 am with NO desats or alarms. So she went 6 hours without a breathing treatment, and I got a little sleep too. Billy slept too, as he was helpful during the day with Ally and cleaning. The 5 am treatment was a little rougher, starting with a small clear throw up with the 1st suction, and a few chunks of mucus, but she Ally only desated to 80s and came back up to 90s with NO oxygen needed (knock on wood and Thank God). For treatments we are IPVing with pulmazyme (or xopenex) to thin the creamy and off and on chunky secretions/mucus and also keep her lungs open. For those not in the medical world, an IPV is a fancy nebulizer type machine that sends bursts of air/nebs that kinda beats on her lungs from the inside to outside to break down the junk/mucus, while using saline or a medicated neb. Since Ally cannot cough effectively or move, this is super important. I then use another machine to cough and suction the mucus and secretions out, so hopefully it doesn’t become pneumonia, or completely block her airway. It all sounds crazy, but overall Ally is doing good and she was pretty HAPPY watching Jay Jay the Jet Plane during this morning’s treatment. It’s still so crazy that I have to worry about docs being mad that I changed the settings on MY daughter’s vent (breathing machine), but I want orders for when we have nurses (not till Monday and then a new one in training). The nurses will understand, and hopefully the only consequence will be is that they have to “report me” so there is no liabilty on them. So far it all seems to be working and allowing us to treat this illness OUT of the hospital (knock on wood and Thank God again). Thank you so much for the prayers and well wishes!!!! Need a few prayers for Ally, PLEASE… She started with a goopy eye and low grade fever yesterday, but now seems to be dealing with a BIG virus (fevers up to 102, vomiting, diarrhea, thicker/creamy mucus and desats to 80s). It has hit hard and really quick, but we are managing her care and breathing treatments at home. 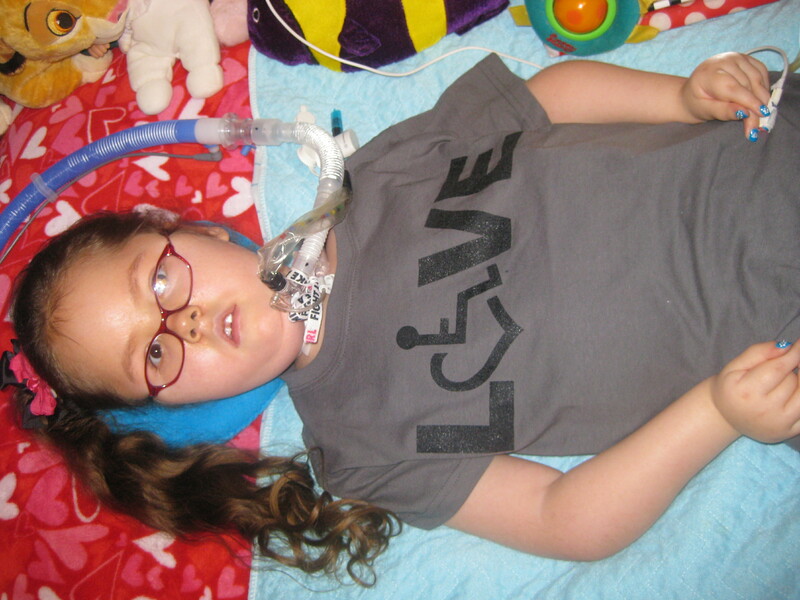 Thank GOD and also that she has a trach. Started an antibiotic this afternoon and made vent setting changes (without doc permission, but waiting on a call back from one since 4 pm). She is doing much, much better with my “mom” changes. Borrowing a co2 detector tomorrow from a friend to make sure the small changes I did on the vent are okay, but no more low tidal volume alarms and less desats to 80s. Ally is getting closer to mid 90s for o2, heartrate is down from 160s to 130s (100-120 is her norm awake). Just need to keep up with motrin/tylenol, new antibiotic, extra pedialyte in her food, breathing treatments and PRAYERS. My little/BIG 6 year old is a fighter! 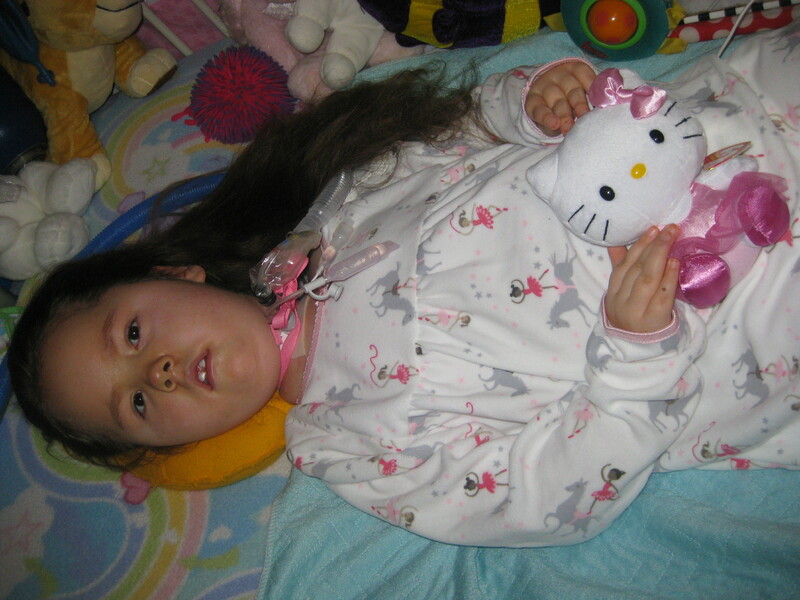 – This is only her 2nd illness since her trach (1.5 years ago), but 2nd this winter. Frustrating since we have been active with 2 days of school last week and Disney on Ice, but I have no regrets. My little girl needs to experience life and LOVES being out of our home. Things are looking more upward this evening with my changes on her vent. Just can’t wait to tell the docs that I’m in charge and I know best. They only want to do vent changes in the picu, but I did try contacting our palliative care team and I will check her co2 tomorrow. – I did talk to pulmo and got the antibiotic, but haven’t heard back from Dr. after talking to the palliative care APN. Really, they probably won’t want to give me permission for vent changes at home, but they ARE working. I changed them a little. Rate change from 18 to 20 breaths per minute. Pressure Control and Pressure Support both changed to 18 from 17/15 and peep changed to 6 from 5. She is breathing MUCH better now and maybe the antibiotic is kicking in. DO NOT want to deal with the PICU unless absolutely necessary. I like a phrase one of my friends used. “Sometimes its better to ask for forgiveness, instead of permission” with our medically fragile children we are taking care of at home! Click on the link to our picasa photo album. More pics will be added, as we are still celebrating. An EXTRA special THANK YOU to the staff and children at Hanson Park School for making Ally’s day at school EXTRAORDINARY!!! 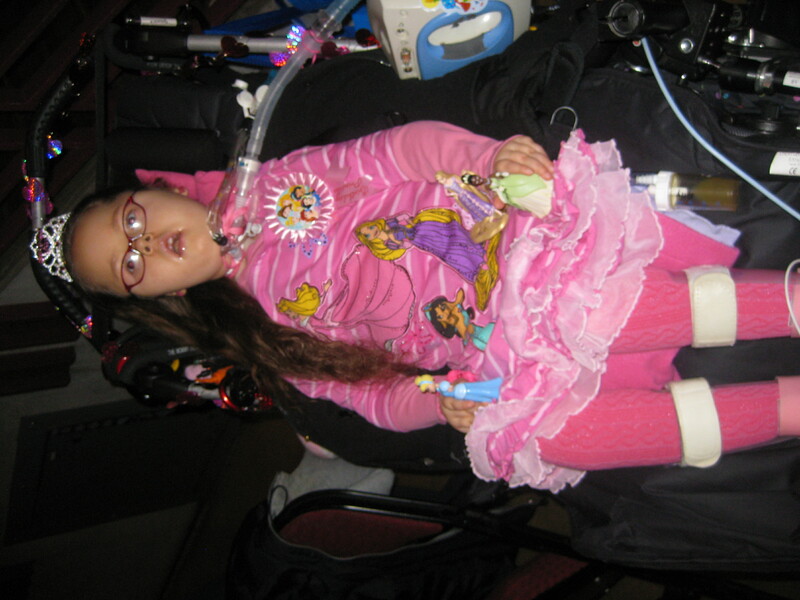 Also, a Thank You to Feld Entertainment for donating tickets to the Disney on Ice Show!